The other day i was having a very pleasant trip to my parents, they were watching Antiques Roadshow. On the show there was porcelain vase that was astonishingly beautiful turns out that due to some tax thing in the olden days for a short period of time porcelain or whatever was taxed very heavily probably to pay for some war, so these vases were actually made by glass blowers they weren't porcelain but white glass. They were so nice that for almost a whole minute i was determined to become a glass blower, i was ready to give up everything and retrain. Don't panic, i got over it! but i feel there is much to learn about Aesthetics from studying other materials. The vase had a beautiful organic shape to it, there were slightly spiralling "ribs" around the outside that had the glass stretched between them it looked similar to a seed pod. After being told it was glass you could tell from the rim that it was, i don't know about glass but it was probably snapped off the stock material to make the opening to the top of the vase, and then melted a bit to remove sharp edges. Anyway this reminded me of some of the stuff Fritiof had for show when he came over, Rob has some nice photos on his blog. The stuff of his i really loved were the birds. My point being that i loved these items because the wood almost seemed stretched, it gave a ligtness to the objects, you can use the bellly of the knife for the slight hollows. I feel like the Aesthetics of the two designs i'm working on at the moment are like forging metal the material feels like it has been hammered out this is shown by distribution of material. The profile of the inside of the bowl does not need to be parallel to the outside, in fact it can have quite a different profile, and i often prefer them that way. Try flexing the spoon along it's length i like it when they don't flex more in one spot than another. Think about shapes as dynamic when you shape a curve where does it start? where does it go? does the tightness of the curve accelerate or deccelerate. Triangulation! all the cool knife grips are about triangulation, it generates absolute control. 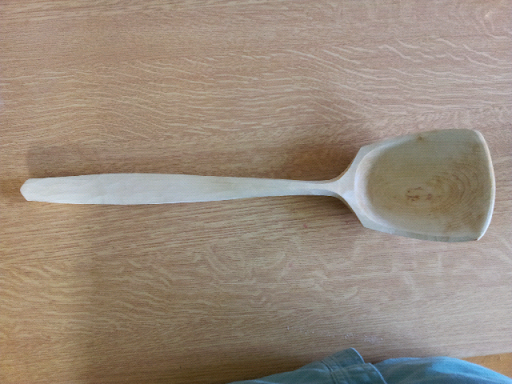 Below are some photos of the spoon i made when Fritiof was here, i finished the hollowing this morning with my new hook. 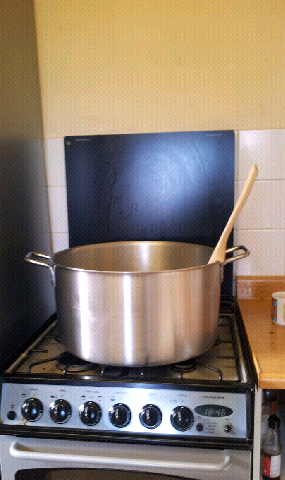 I am pleased to have such a large spoon to go with our new 18.5 litre pan, the pan holds about 30 odd portions of food and the new spoon serves one portion in one dollop. The hook is great for stopping the spoon dropping in the pan and for storage, i like the hook position so it doesn't interfere with holding the handle. The shoulders of the bowl are a signiture of Fritiof's spoons and are a great design feature that is easy to achieve.